Venice is an important cultural destination in Los Angeles, made popular by artists who now face eviction as costs of living skyrocket. In order to save this unique community affordable housing is needed specifically for working artists. OACLA was enlisted by Sandy Bleifer, an artist and community organizer for a collective of local artists, to help visualize an artist colony at a recently vacated site in Venice. 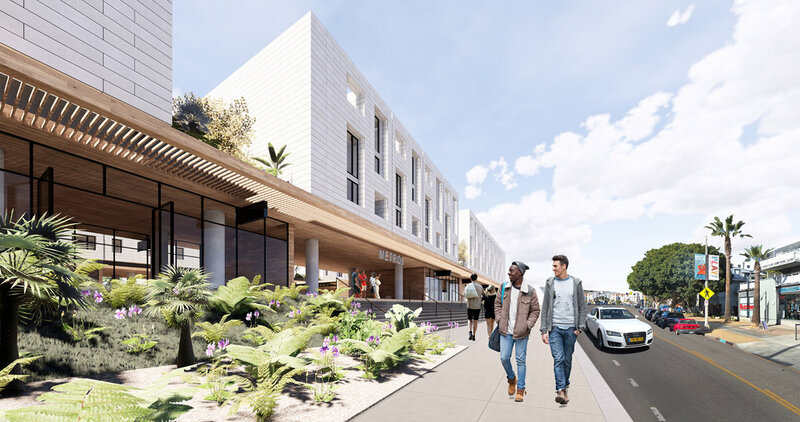 Located on Main Street near Abbot Kinney, the future of the former Metro Division 6 bus depot site is currently being explored. Temporarily, it will become bridge housing for individuals suffering from homelessness in Venice. However the long term use of the site is dependent on a soon to be released RFP by Metro. As part of this community-based process to determine the new use of the site, we have helped Sandy and the grassroots group develop a program and conceptual design for a future artist colony, and participated in Metro organized community outreach meetings to hear directly from residents about what they would like to see developed. Additionally our group has developed a website for residents unable to attend to allow for easy input and feedback, VeniceArtPlace.org. Los Angeles has plenty of luxury, high-end apartments. It is time to help resident artists sustain themselves and provide cultural amenities that serve the public. The primary component of the site would be tailored to artists: affordable artist live/work studios accompanied by office and workspace, exhibition space, and space for events and performances. Additionally the site would be anchored by retail program and parking. Located centrally between Venice and Santa Monica, the site must also allow for accessible public transportation and enhanced beach access among other things. The full vision as summarized from multiple community workshops can be viewed here. We look forward to seeing our collaborative efforts realized by Metro!